The Thai-European Business Association (TEBA) would like to invite you to attend an all day seminar session and networking event titled “How to work with Global Tier 1’s in ASEAN”. 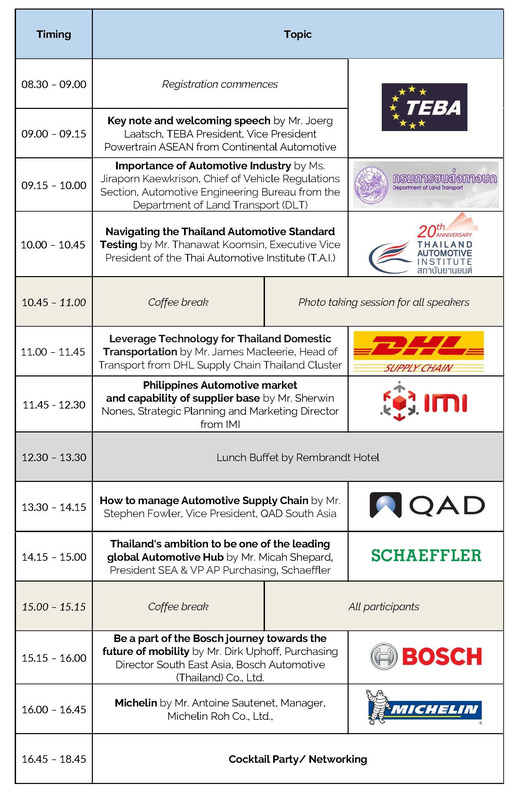 This will be held on Thursday, 22nd November 2018 at 08.30 – 19.00 hrs, at the Room Rembrandt 3, Floor 2, Rembrandt Hotel BangkokThe seminar session will be interesting to anyone in the Automotive manufacturings sector and other Tier 1/2/3 companies as you will gain an beneficial insight into the future of ASEAN and how these big industry leaders plan for it. The main focus is for participants to get an overview future of the Automotive Industry with experienced leaders from around ASEAN and to share with them your thoughts and make fruitful business connections. This seminar session will be an all day session with lunch and networking cocktails at the end of the day. **Note: Agenda subject to change by TEBA without any notice.